Scald the live lampreys in hot water. Scrap the slime off with a knife. When opening the lampreys catch the blood and save. Take a knife and insert (literally introduce) it in the mouths. Pierce them. Do not cut them, only prick them. Remove the guts, bile and the central nerve through the head. Strain the blood out from the holes in the body. Save all of it. Mix the pepper, galingale and half the nutmeg with the blood and rub the lamprey with it. Put the rest of the nutmeg in the mouth and a place a clove inside of each hole that it has. Cut the fish in half. Make the pie crust into the shape of a circle and place the lamprey in it. Pour a little olive oil over each fish Top them with a layer of pie crust and pinch it together. Prick holes in the top to release the steam. Bake it in oven for about 45 minutes until done. Mix the bread, all the remaining blood, vinegar and wine. It should be slightly bitter. If too bitter add more wine. When the pie is baked place the sauce inside the pie if serving it hot but not if the pie is served cold. It is better when eaten cold. Nola warns that lampreys are not good to eat until January. 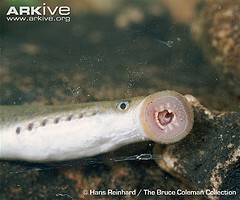 Lampreys travel from the ocean to freshwater to sprawn from early January to the end of April. The River Miño in Galicia is famous for them. On the second to the last Sunday in April a festival is held in the village of Arbo where 20,000 people attend and there is a lamprey cooking competition. 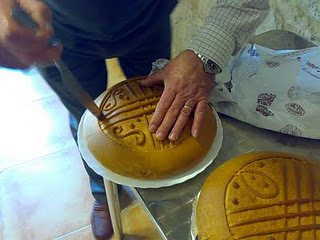 Pontecesures and As Neves, also on the Mino River, are famous for their pies too. England also has a long tradition of lamprey pies. Queen Elizabeth II was given one on the day of her coronation in 1953. Reportedly Henry I of England died from eating "a surfeit of lampreys" on December 1, 1135, over 300 years before Nola’s warning! It should be interesting to know which pie crust you reccomend. I have one recipe for "true" empanada gallega, with two different doughs mixed together (first one with the yeast, which must rise, and a second with egg). I have a friend who loves to fish. He gives most of his catch away because his wife refuses to clean them! Would love to have your recipe for Gallegan crust. Common crusts in Chile are like those for "armoured chicken" - unfit to eat they are so hard and tasteless.Muslims in Spain had a leafy crust, a predecessor to puff pastry. With all the lard in Spain I think there were good light crusts for pies/empanadas.